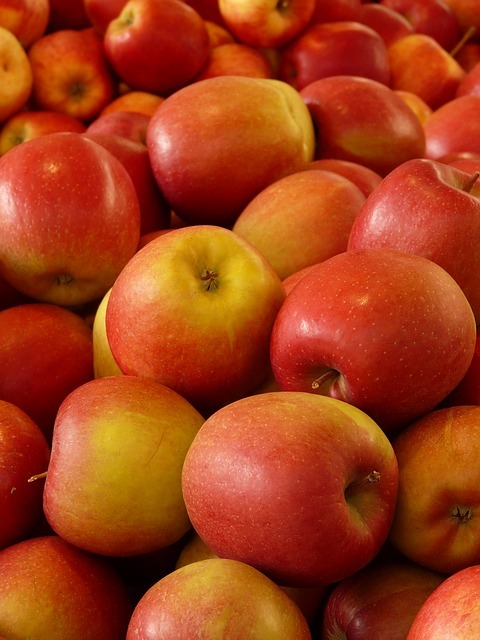 Purchase apples that are firm, brightly colored and have a fresh fragrance. Deep green background colors on apples typically indicate an immature fruit. Mushy and or musty smelling fruit should be avoided. Select an apple with smooth skin and no bruises, blemishes or gouges. Bruises on an apple indicate that the apple may rot sooner. Some apples may have a dry area that is a light tan or brown color. This is known as scald and usually does not impact the taste. How long an apple can be stored depends on the variety. Some apples can be stored as long as 3-6 months while others have a much shorter storage life of only 1-2 weeks. The largest apples should be consumed first saving the smaller ones for later. Larger apples tend to breakdown fastest. Any apples with bruises or soft spots should be removed from the bunch because they will rot the others. Apples should be stored in a location with a constant cool temperature, such as in the refrigerator or in a cool cellar. Apples kept at room temperature ripen 10 times faster and only remain fresh for a few days. Apples can be frozen whole. Simply wash them and then place them on a tray in the freezer. When they are frozen transfer them to a freezer bag. Apples can be frozen sliced. Wash, peel and core the apples and then slice them to the desired size. Dip the apple slices in a bowl of water and lemon juice to prevent browning. Place them on a tray in the freezer and then once frozen transfer to a freezer bag. Apples should be harvested ripe. However, if they are picked prematurely they can continue to ripen. Place the apples in a brown paper bag and fold it closed. Apples produce ethylene gas, which promotes ripening in numerous fruits, including apples. This can be harmful when other ripe fruits are stored with apples, however, it can also be helpful when fruit needs to ripen further. The apples will ripen however, the taste may be a bit different than apples that ripened on the tree.